Bulk SMS Marketing Software for Windows based mobile phones provides real time benefits for users using Microsoft windows based mobile phone. 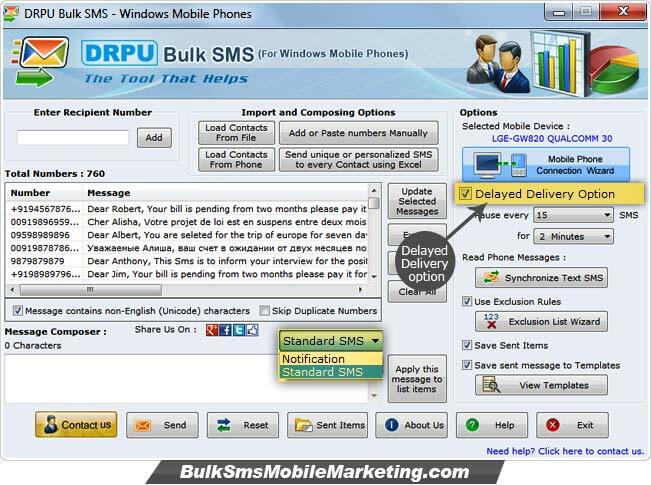 Bulk sms windows mobile software sends sms from your Desktop or Laptop system to group of mobile phone users using major Microsoft windows based pocket PC devices. Windows mobile messaging program delivers sms without any internet connection or sms gateway required. Software allows you to create your own windows mobile sms gateway and broadcast thousands of windows mobile messages in one click. Send sms to individual or list of contact numbers. No need of any internet connection required when sending bulk text sms. Software provides facility to save sent messages as templates.